3. For a group of 6-8 children we provide 4-6 instructors. 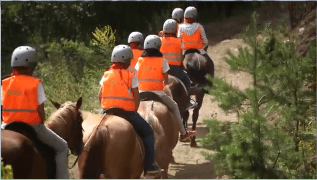 They take care of the children during the horse riding and provide their safety. 4. 40 minutes’ walk with the horse. 4. The swimming session at the indoor pool lasts one hour. 3. Children will mountain bike only in the presence of and following the guidelines of the instructors. 4. Before pool excursions, children will receive additional safety instructions. 3. Please, keep in mind, that a hit from a paintball pellet may cause bruising. Once every 14-day shift the children visit an attraction of outstanding value in the region. Visited so far: Dancing Bears Sanctuary – Belitsa town, the town of Melnik, Rozhen Monastery, Kovachevitsa and Leshten, the ancient fortress Nicopolis Ad Nestum. In LuckyKids green school children are engaged in wide range of entertainment from morning to night. Every year there are various evening parties of attractive themes and necessarily educational element such as: Treasure hunt, Bingo night, evening of “Truth or Dare” Pillow Fight, Neon party, Night of the different nationalities, Gala evening and more. This programme excites kids and adults equally. Hurry up and make your reservation for summer school LuckyKids, because spaces are limited.